"Run, Barry, Run!" is one of my favorite lines in The Flash episodes that I watch on t.v weekly. 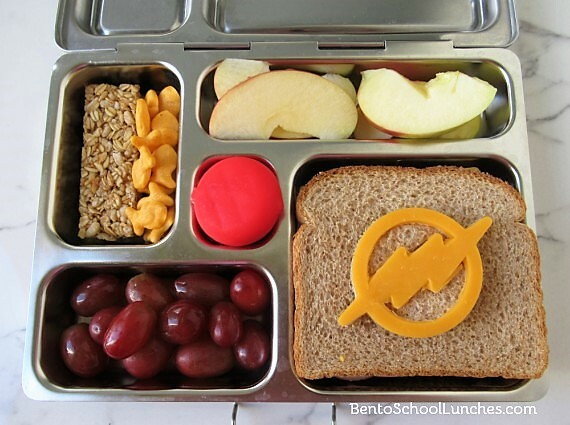 Since we watched the movie Justice League during the weekend, I decided to make a superhero lunch for Nikolai. A while back I acquired a set of superhero cookie cutters and one of them is The Flash, one of my favorite characters. Time has been flying by like flash especially this time of year. Thanksgiving is around the corner as well as Nikolai's birthday. Those of you who have been following along may already know that Nikolai was born on Thanksgiving day, thus, his birthday will always be around or on American Thanksgiving. It may be a little hectic, but always fun to host parties. For the bento lunch pictured above I made use of that Flash cutter to decorate a hero sized sandwich. With that I included some slices of apple, red grapes, Babybel cheese, organic granola bar and cheese crackers. For those who might be celebrating perhaps Thanksgiving, a birthday, a bit of mad shopping on 'Black Friday' or just chilling for a relaxed weekend at home, I wish you a safe and enjoyable time. Thank you so much, Shannon! I hope you had a great Thanksgiving!